Okay folks, I finally watched The Marvelous Mrs. Maisel. So many of you have recommended it over the past year, and I’ll admit you all were right. Karl and I started on the holiday break and fell in love so fast we slowed down, dreading the end of Season 2. And we watched the Season 2 finale this past Monday. If you haven’t watched this series on Amazon I can’t recommend it enough. It’s witty and funny and the fashion is fantastic and it is just so beautiful to watch. It’s easy to binge it, but it’s so delicious to watch an episode and wait, discussing it, mulling over the content, waking up and being aware of what parts stuck with you. I know I am not the only one who saw bits of herself in Midge, and I even texted a good friend who is my “work wife” as we discuss and inspire one another with our businesses with, “I hope I am the Suzy to your Midge.” Some didn’t like the second season’s focus on the parents but I personally loved it and want Tony Shalhoub to win every award possible for his role. Watch it, you won’t regret it. The show has inspired us to watch stand-up comedy on Netflix. We have a family account, one for Karl, one for me, one for our daughter, and yes… one for my sister and one for my mom (Shhhh don’t tell Netflix). It’s funny, if I search “Stand Up Comedy” on my Netflix account I get about six offerings, Jim Gaffigan, John Mulaney, and a bunch of women comics I’ve never heard of that I Google to find they’re famous from YouTube. When we search on my husband’s account he can scroll and scroll and scroll and get tons of offerings… though they’re Louis CK, Jim Jefferies, Dave Chapelle, and various other controversial men (and one or two Iliza Shlesinger at the end of the search). I don’t watch Netflix often. I did go through a period of The Good Place, Glow, and The Unbreakable Kimmy Schmidt but didn’t finish any of the series. I do love Queer Eye, and have caught a couple episodes of Marie Kondo's new show. While my mom was recuperating from her surgery this winter, I watched a few horrible Christmas movies on my account, and I did watch Dumplin’, Dude, To All the Boys I’ve Loved Before, and Sierra Burgess is a Loser. I also watched Ali Wong (she’s the only reason I continue to DVR American Housewife), Dave Chapelle, and John Mulaney. I think the only series I semi-binged on Netflix was The Crown (a binge for me means more than one episode in a day; it still took me two months to finish). So yeah, if you look at my viewing history I do look like a suburban middle-class white lady between the age of 29-45. But why suggest such limited comedy for me? My husband, on the other hand, watches far more Netflix. He’s all about history, documentaries, space, and art. On his account, we’ve watched series like Marco Polo, Luke Cage, Jessica Jones, and Iron Fist (which isn't worth watching IMO). We’ve watched a few action films and dramas, and I know he’s watched more on his own time. We’ve watched a few fashion documentaries and pieces about 20th century icons, tastemakers, and changemakers (do check out the one about Susanne Bartsch!). Likely Netflix can tell he’s a suburban middle-class white man over the age of 35, but where in his history does it make it where Netflix thinks he wants to watch Louis CK, especially in January of 2019? So I am reaching out to you. What comics on Netflix or Amazon do you love and recommend we watch? Speaking of comedy, this week we lost a comedic legend with the passing of Carol Channing. This piece in Variety shares her history and extensive career. The latest trend in fashion is celebrity collaborations. From bloggers to big-time names it’s a way to get a rabid new customer base. Thanks to Forever 21 being the idea-stealing company they are, the validity of these celebrities having true input into their collections is being questioned. Confused? Check out this piece from The Fashion Law. Instagram can be repetitive (oh look another woman in bed with fuzzy socks, a cup of coffee, and a book), demoralizing (another woman with a six-pack talking about body positivity), or dangerous (after seeing 20 beautiful women with the same $100 face cream it’s really tempting to open up Sephora and blow your budget). But in the past couple of months, I’ve seen a positive trend… community. Strangers connecting, sharing advice, supporting one another, finding common ground. This piece from the Atlantic delves into this trend. Today I am celebrating both life and death; a memorial service for a friend and then my sister's birthday. To those attending The Women's March, I wish you a safe, inspiring experience! As a retired hospice nurse, I suggest you educate yourself further on the subject of opioids at the end of life. “James Acaster: Repertoire” is a great 4-part stand-up comedy show on Netflix. Hari Kondabolu, Maria Bamford, Hannah Gadsby, Hasan Minhaj, and Maz Jobrani have terrific specials on Netflix, too. The other great thing is that the more I watch (and especially watch diverse comedians) the more wonderful suggestions appear in the queue. Also enjoyed “The Standups” which are shorter episodes from a bunch of different comedians. Other white dude suggestions would include Bo Burnham, Neal Brennan, Mike Birbiglia. Ohh, Hannah Gadsby! The Ellen Degeneres stand up special was great, all Ali Wong, Jen Kirkman, Hannibal Burgess, anything and everything Hasan Minaj, Chelsea Piretti. For TV Grace and Frankie is a good show to watch with female relatives. Thanks for the suggestions and the link! These are not comedy shows but I highly recommend watching on Netflix Bodyguard, Narcos, Narcos Mexico, and The Great British Bakeoff. Also, whenever I need a laugh, I watch old episodes of The Office on Netflix. The earlier ones are the funniest. I also like watching cute old movies. Last night I watched Becoming Jane (about Jane Austen, stars Anne Hathaway) and last week it was Mona Lisa Smile. Thanks for these suggestions, Ann Marie! For short viewing tolerance, I highly recommend Salt, Fat, Heat and Acid–especially if you need inspiration for cooking. Grace and Frankie is also a wonderful conversation on aging, with a lot of commentary for women. I love your weekend reads! There is always something interesting that gets me thinking, that I probably wouldn’t have come across by myself. Here’s one I did come across: https://www.themonthly.com.au/issue/2015/may/1430402400/helen-garner/insults-age?fbclid=IwAR3jmeMNyVuXnObwGi5bq0pO5StqLwc7K4BFOm2eaReNvIRG6K-omt9iPAI. I am nowhere near an age you could call elderly, but it’s certainly thought-provoking. And makes me wonder what stops me from being that free now! Thank you for sharing this link, Trudy! I always love Dave Chapelle because he somehow speaks my thoughts (I think it has to do with the fact that I grew up in SW Ohio), but by far our absolute favorite comedy special is John Mulaney’s “New in Town”. OMG, is that the funniest thing my husband and I have ever seen, and it holds up over repeated viewings. There’s a newer one that’s good, but that one is the best! John Mulaney is so funny! 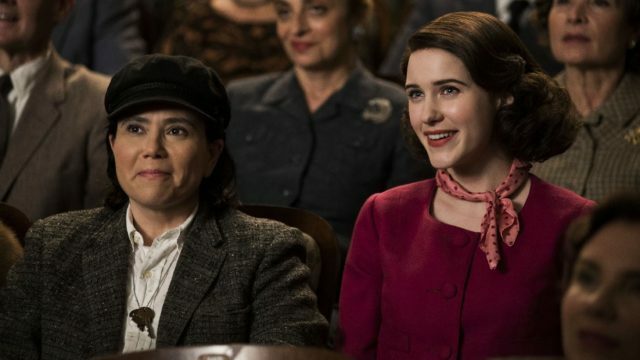 Netflix: I love Mrs. Maisel as well. Tony Shaloub was wonderful in season 2. I also have enjoyed Jessica Jones as well. Daredevil is also excellent. River starring Stellan Skarsgard is also fabulous. thanks for the suggestions, Suzanne!